In late 1919, thanks to the persuasive powers of Loughborough College Principal Herbert Schofield, the County Council bought 14 acres of land on Ashby Road for playing fields. Schofield was able to increase the area within months by purchasing a further parcel of land and acquired another 12 acres in 1921. Levelling the ground and laying out pitches was commenced early on and a cricket pavilion, complete with dressing rooms, shower, slipper bath, lounge, tea room, and even a small gym, was built. 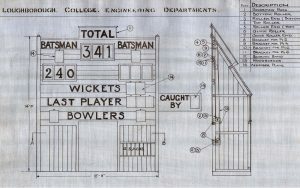 A cricket screen and scoring board were designed by the College workshops. The grounds and pavilion were officially opened by Lord Crawshaw of Whatton House on 13th May 1921. This cricket ground was located where the Student’s Union now stands. By 1923 the playing fields stretched to over 30 acres and besides the cricket pitch included two rugby pitches, two football pitches, a hockey pitch, and grass and hard tennis courts as well. 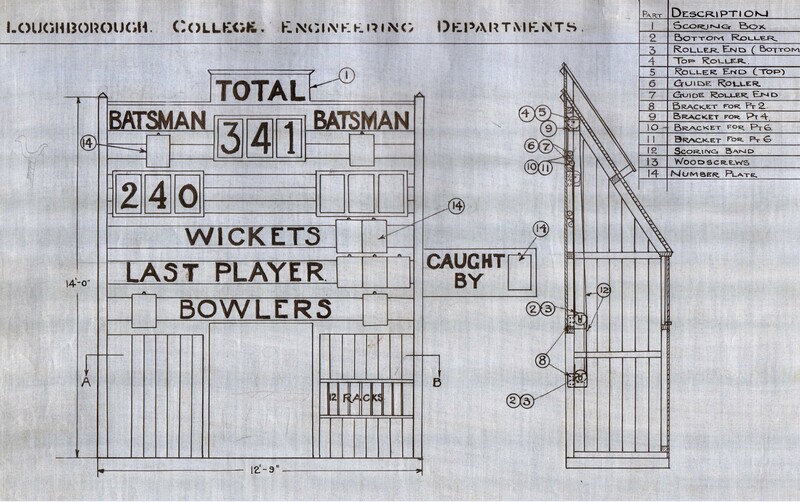 In early 1923 1000 square yards of turf was ordered for the cricket pitch from Leicestershire County Cricket Club at a cost of £41.5s 0d and a concrete practice pitch was also planned ‘to the specification and tender from the College Works Department’. All this work had been completed by June and towards the end of the year the College received a request from Leicestershire CCC for facilities to play Minor County Championship matches at the College ground. It was agreed that the ground would be available for County matches during the 1924 season. 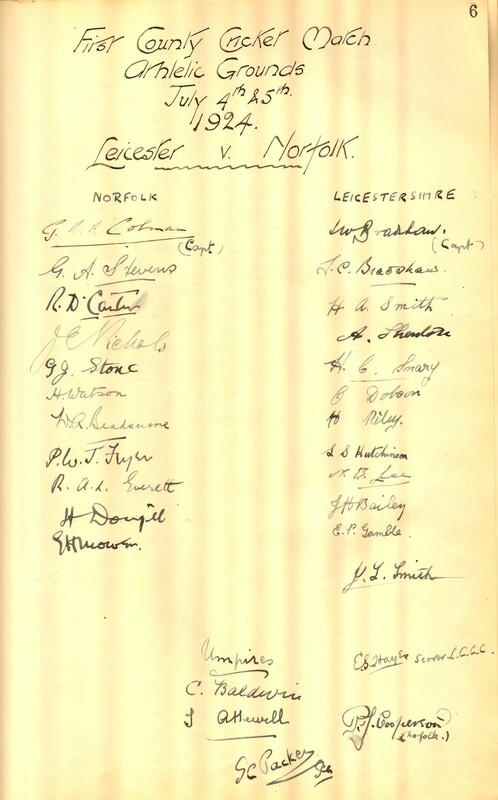 The first ever county cricket match held at the College ground was a Minor Counties championship game between the Leicestershire Second XI and Norfolk, played over two days, July 4th-5th 1924. The College Union agreed to provide tea for the teams on both days and the Leicestershire CCC was to organise catering for the public. 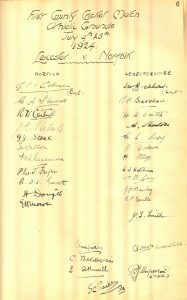 While all the Leicestershire players seem to have been professional, Norfolk included three gentlemen amateurs, notably GEE Colman (Eton & Oxford) of the well-known mustard firm. Leicestershire’s best known players were probably the bowlers Horace Snary and Haydon Smith, and the team’s coach, who acted as scorer for the match, was the ex-Surrey and England all-rounder Ernie Hayes, renowned for scoring 276 in a partnership of 371 with Jack Hobbs against Hampshire at the Oval in 1909. Norfolk won the toss and decided to bat. The result? After a shaky start in a generally low scoring game Leicestershire batted well in their second innings and managed to win by six wickets. Several other Minor Counties matches were played on the College ground in the 1920s as well as two first class games, against Derbyshire in 1928 and Glamorgan in 1929 (see picture here – one of the College’s radio masts, erected a few years earlier, can be seen in the background). However, the increasing cost of preparing suitable pitches and hosting the matches was beyond the means of the College Union and no more county matches, as far as we know, were played on the this ground.